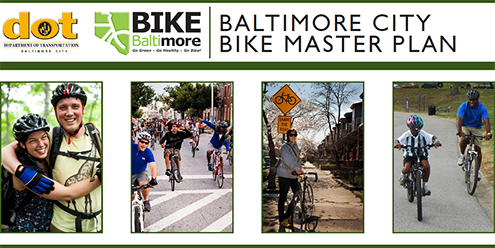 The Baltimore City Department of Transportation is pleased to present the final 2015 Bike Master Plan and a summary of the final public review process. This page provides the Final Bicycle Master Plan document and provides a summary of all the comments collected from the final public review. The final public review included collecting and compiling comments from the public meeting held in January, the online public review webpage, comments sent to the DOT through email and letters from organizations that presented comments that reflected the review of an organization. For each comment submitted, the DOT also summarized a response and/or how each comment was addressed in the plan. All comments are provided in order by the date of which they were received. The DOT would like to thank everyone’s participation in the final review process and we feel the detailed consideration of the input provided has made a great document even better. The adoption hearing for the plan will be held at the next Planning Commission meeting on Thursday, March 26th.